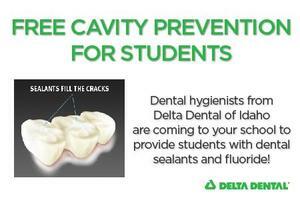 Since 2007, Delta Dental of Idaho has worked with over 60 school districts throughout Idaho to conduct free dental clinics. Dental sealants are placed on children's molars, where 90% of cavities occur. Both the sealants and fluoride varnish are quick and painless to receive. All 1st, 2nd, 7th, and 8th graders who have a signed permission form.